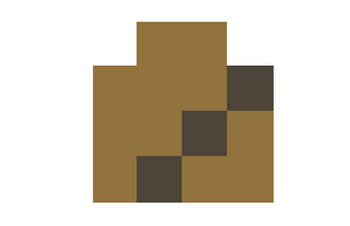 Can you still recognize a character when it's cut down to just 16 colored squares? That's what one internet artist seems to be trying to find out. Usually when we refer to something as being pixilated, it's either been blurred out or isn't as sharp as we'd like. For artist David Stoll, however, it means something quite different, as he takes his subjects and shrinks them down to just a handful of pixels. Stoll takes iconic characters from videogames, movies and television - like Star Wars' Chewbacca, as seen to the right - and draws them using no more than 16 pixels in a 4x4 grid. Once that's done, he makes them sixty times bigger so that people can actually see what they are. Stoll doesn't say what the experiment is intended to prove, but it seems reasonable to assume that it's something along the lines of seeing how much you can strip away from a character and still have something recognizable. So far, Stoll has pixilated 24 characters, one cathedral and a Tetris block. Some are more successful than others, especially those that have distinctive color combinations like Bart Simpson or Tigger from Winnie the Pooh. You can see Stoll's full gallery here.